Jerry Cornelius, recently told that the world will come to end in one or two years, has also just suffered the death of his father. A Nobel Prize winning scientist, Jerry seems expected to carry on his father’s work, whose last achievement was a design for a perfect, self-replicating human being contained on a microfilm. The microfilm is in the possession of Jerry’s psychopathic, drug-addicted brother Frank, who has also kidnapped their sister Catherine and is force feeding her drugs. Enlisted by some scientists to steal the programme from the Cornelius family, Jerry sets out on his mission…..
My introduction to the writings of Michael Moorcock was through a band I used to be crazy about called Hawkwind. One album Warrior At The Edge Of Time had couple of Moorcock-inspired songs and even the guy’s voice, while another, The Chronicle Of The Black Sword, was entirely based on his Elric Of Melnibone books and the writer even appeared on stage with the band. Moorcock wrote over 200 science fiction and fantasy novels, many of them based around a wonderful premise: that of the Champion Eternal, who exists in every time and every universe, condemned always to fight, yet never know why he is fighting. He has many incarnations and is even sometimes female. I never got around to reading the Jerry Cornelius series, Cornelius being a version of the Champion Eternal, and the first book being The Final Programme. The anarchic, anti-establishment elements of much of his work nonetheless appealed tremendously to me in my early 20s. Though the writer did co-write the script for the dinosaur movie The Land That Time Forgot, it is amazing that only one of his books have been filmed, though actually come to think of it the complex philosophical aspects and reversals of many fantasy and science fiction cliches would be problematic to many producers and I doubt will draw big audiences either. 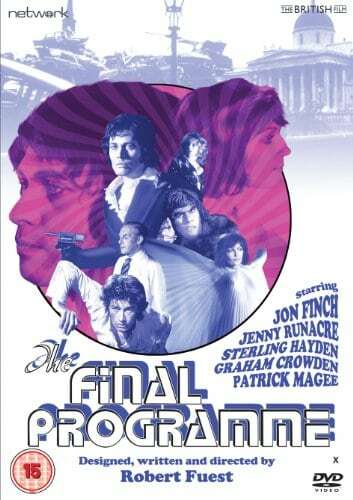 So The Final Programme is all we have at the moment and it’s a slightly muddled but still striking and very stylish work, sort of The Avengers [the TV series] meets A Clockwork Orange with a bit of LSD throw into the mix. It’s also rather dated, though that’s part of its charm. Moorcock himself doesn’t like the film. He extensively altered the script by director Robert Fuest, a former painter who did the set design on most of his films and had made the Dr Phibes films so much fun, because it altered or toned down too much of the book, but Fuest used his own original script anyway, to Moocock’s chagrin. He especially hated the ending that Fuest devised, though I actually think it works for the film. At least one of Fuest’s ideas, using Billie Holiday for the soundtrack, never came to fruition. Mick Jagger turned down the lead role because it was “too weird” [this is from the guy who had recently made Performance!] and would you believe it Timothy Dalton almost played it too. As for Hawkwind, they can be briefly glimpsed [though not heard] in one shot, but a longer scene where they and Moorcock himself appear was cut out. The Final Programme got mostly poor reviews and lost 8 minutes for its US release entitled The Last Days Of Man On Earth. Moorcock has occasionally spoken tantalisingly of a version closer to his preferred concept. The film begins intriguingly with lots of people carrying wooden beams in the desert, surrounded by nothing but sand and rock. It is actually to go to make a funeral pyre for the hero’s recently diseased father. Jerry Cornelius is soon revealed to be a truly odd chap but I’d like to see more strange heroes like him on screen. A kind of James Bond viewed through a psychedelic lense, he goes around in a velvet frock coat and ruffled opera shirt, is constantly on the booze and has a fridge full of biscuits [in fact that’s all he seems to eat]. The world he exists in is very much a heightened version of the Singing Sixties, with drug taking, sexual promiscuity and lack of respect for authority rampant, but this was also the 70’s, and Fuest embues all this with an element of cynicism so strong that it almost looks forward to the punk movement. This world, whose end only Jerry seems to be aware of because everyone else is “too busy watching the bloody commercials”, is obviously on the verge of break-down. The lowish budget seems to have prevented the filmmakers from showing much of this, but the feeling is there, and there is one great image of cars piled high in the Thames. Outside tends to look not much different from now [or rather 1973: funny how they assumed that shops would still be closed on Sundays in the future! ], though there seem to be a few more ruins about. Meanwhile inside people tend to live in huge 60’s pop art designs. 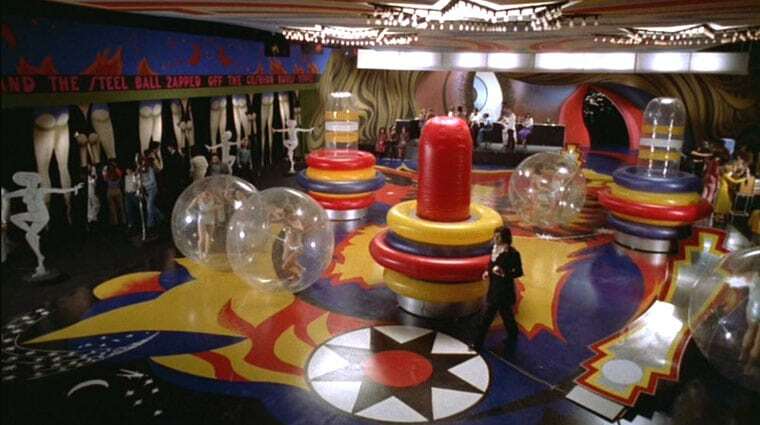 Fuests’s experience as set designer works wonders in many cases, from the series of silk tunnels to the pinball machine room which is like a giant pinball machine itself, replete with women walking around in huge balls. The film reveals itself to be essentially of two parts, Jerry battling his brother, and the plan to create this super-being. The early assault on Franks’s house, which has a remarkable array of weapons and booby traps from a ray that causes epilepsy to a chess board door that either opens or fires a dart depending on which move you make, is a great combination of inventive design and tension, and, while this isn’t really an action movie, it is certainly, in part, a weird comedy, with a fight scene that looks like it’s come straight out on the Batman TV series. The film doesn’t really gain much momentum as it approaches its final section despite one sequence going into psychedelic filters, but the end scene, the one that Moorcock loathed, and one which seems to both be inspired by 2001: A Space Odyssey and prefigure Altered States, reveals the film to be probably more cynical than the book ever was, and if it seems a bit random, look out for the drugs Jerry throws in just before! The feeling is that of, we get what we deserve. Despite being on the surface a ‘fun’ romp, it’s actually quite a dark affair deep down, anger and bitterness seeping in everywhere from the dialogue [especially from Jerry] to the settings. Like in Fear And Loathing In Las Vegas, the fall-out from the 60’s ain’t pretty. 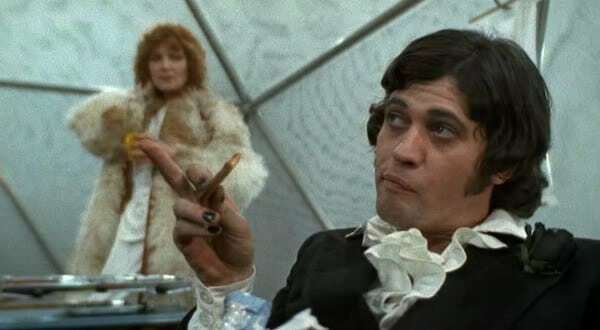 Jon Finch [who reminds me of Oliver Reed here], as Jerry, strolls through all in sardonic fashion and actually seems almost normal compared with the other eccentrics on show. Most of the time he is accompanied by a Miss Brummer [Jenny Runacre], who goes around sleeping with everyone, whether male or female, in sight before absorbing their bodies. Then there’s Sterling Hayden who shows up for one scene virtually reprising his unforgettable role in Dr. Strangelove, only this time he sells missiles rather than sends them, Patrick Magee as another strange recluse, and many other great character actors and actresses elsewhere. The roles often seem to be caricatures on archetypes and don’t always seem vital to the plot. For a start, Jerry buys napalm and missiles he never even uses! Sometimes it feels like scenes have been chopped out, perhaps at the script stage because the budget wouldn’t allow for them, and there’s a lot of infuriating vagueness. Are we supposed to assume, for instance, that Jerry is a terrorist, something definitely hinted at? A little more clarity may have helped, but then this was the 70’s and we are just far used to having everything spelt out these days. Though its use of a semi-comic march theme doesn’t work too well, The Final Programme’s score by Paul Beaver and Bernard Krause, with great saxophone and guitar work [by Eric Clapton], is very diverse, if very 70’s, and contains some fine pieces, while Norman Warwick’s photography is expert: some early shots of a fog-shrouded lake are incredibly atmospheric. A lot of good work went into The Final Programme and it should definitely be seen by anyone yearning for something off the beaten track, though even I, who have not read the book, can see that they missed the mark a little. It perhaps needed more money and a director who wasn’t concentrating on set design at the expense of everything else, but then the occasional ‘make it up as you go along’ feel to many films from this time is part of their appeal. In any case, it looks great [as usual, Network seem to have worked wonders in restoring the film], is both inventive and hugely evocative of the time it was made in at the same time, and is also just damn cool.